"There is a bit of a traveler in every one of us...but very few of us know where we're going." These are the original musicians that played with Mickey Mulligan when he first started the band. Jack Duggan is a world-renowned combat trombone player. However, trombone is not a usual instrument in Irish folk songs, and is certainly less accepted in American bluegrass. Besides, he found a mandolin in the hands of a passed-out person sleeping on the streets one night, and he has been in love with its two G-strings ever since. For seven months from 1999 to 2000, he sang high tenor harmonies, complimenting Mickey's lead singing, frequently also singing lead himself and occasionally keeping rhythm for the band on the bodhrán. He recorded "Molly Malone" and "Bog Down in the Valley," singing lead on The Travelers' first CD. His Irish roots come from his mother's side, when she emigrated from Tralee, County Kerry to the United States at the age of eighteen. 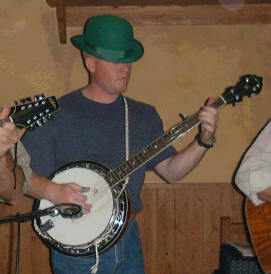 He has played at such pubs as Hennessey's and Tom Giblin's Irish Pub, both in Carlsbad, California. He played regularly at The Morrigan's in Okinawa, Japan alongside Mickey as one of the frontmen in The Travelers. He presently lives in Southern California, tending to his animals, a Mustang and a Hog, while awaiting a Travelers reunion in March 2001. Is Jack Duggan really the "Wild Colonial Boy?" Rowan O'Connell has played the five-string banjo and guitar for more years than he can remember, with a very strong background in American bluegrass music. Rowan has strong Celtic roots, both in Scotland and Ireland, but when you hear him, you can tell by his accent that he is for the most part a Southern Scot. Although you might think that his nickname comes from his red hair, it is actually because his mother whupped him so hard as a lad his arse turned bright red. As Rowan says, "They call me 'Red' because you just can't call me 'Beet' any more." Besides his smoking banjo licks, he also sang harmony with The Travelers for six months during the 1999 to 2000 season, several tunes of which may be heard on The Travelers' first CD. He hopes to move back to the United States soon, hopefully in time for a Travelers reunion in March 2001. Colleen Galbreath was the latest member of The Travelers, prior to their "temporary" disbanding at the end of May 2000. She added a needed dimension to their performances with her fiddle playing on the traditional Irish dance tunes. Her mother emigrated from Ireland to America, and although Colleen grew up as a Wyoming cowgirl, she never strayed far from her Irish roots. She has been fiddling since the fiddle was taller than herself, and after entertaining farm animals, then playing in the Wyoming Symphony, she made the inevitable move to join The Travelers. 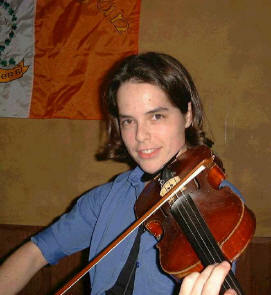 Not only did she add her extraordinary fiddling talents on traditional jigs and reels during the early months of 2000, but she gave the band's fans one more charming Irish smile. She recorded several fiddle tunes on The Travelers first CD, including "Dunmore Lasses" and "The Lark In the Morning." She also hopes to return to the United States in time for The Travelers' reunion in March 2001. Martin "Madman" McIntyre has been a real-life chef for sixteen years, and manager of several Irish pubs. 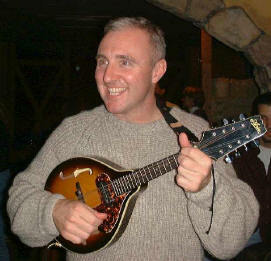 After leaving Dublin many years ago, he travelled to Tokyo where he was manager of an Irish pub, and its renowned chef. He was invited to help open The Morrigan's in Okinawa, Japan in April, 1999. When he arrived in Okinawa, he stepped off the airplane and loudly pronounced, "It's MY island!" This was the origin of his nickname, for all of you Braveheart fans. During his spare time, he played originally with Mickey, and eventually helped to form The Travelers along with Jack. 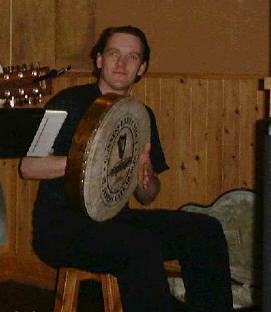 He kept time on the bodhrán, the Irish drum made of stretching animal skin over a round wooden frame, and also the spoons, for eight months from 1999 to 2000. You can hear his percussion work on The Travelers' first CD. If nothing else, he makes a great lamb stew among other dishes, and will be happy to serve you his finest fare if you take the time to come down and visit the pub. By the way, he can't sing a lick, but he will cuss at you in Gaelic if you invoke his ire. Although not one of the musicians with The Travelers, but known as the "Ornery Irish Story Teller," Dan "Fibber" McGee has often appeared at their performances, delivering witty and poignant Irish stories. He also wrote the liner notes and gave the introductory Irish toast on The Travelers' first CD, and has been one of the biggest supporters of the musicians via his contributions in the universal currency known as "beer." The sources for his stories are questionable, hence his nickname, "Fibber." (By the way, he also claims to be younger than thirty.) He has both Gaelic and rebel blood, so keep him away from the whiskey! He has been known to lift lads up by their necks, which is why everybody is so attentive to his stories. Ever want to find out what an Irishman would wish for if he was granted only one wish? Or maybe find out what happened at an elderly Irishman's visit to the doctor? Or perhaps learn a real Irish toast? You may just find out if you happen to run into this rebel, who happens to still be exiled to the island of Okinawa. So, tell us, "Fibber," what do they call Jock now?